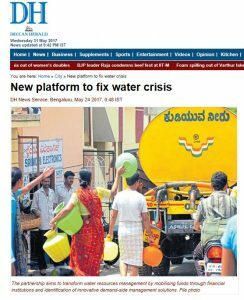 Karnataka’s urban water demand and supply gap is set to widen from 24% (2011) to 58% in 2030, according to 2030 Water Resources Group, a unique public-private-civil society collaboration. To address this growing gap between demand and supply, the state government and 2030 WRG launched the “Karnataka multi-stakeholder platform for water” on Tuesday. The partnership aims to transform water resources management by mobilising funds through financial institutions and identification of innovative demand-side management solutions. “The need of the hour is for corporates to partner with farmers to create a supply chain model that helps in the economic empowerment of the farmers. When the government also partners in this model, the implementation will be more effective,” said Bastiaan Mohrmann, Co-Lead, Asia and Middle East, 2030WRG.